A bunch of hummingbirds is called a charm, a delight and an adornment, and for the last few months, I’ve been blessed to have my view delighted and adorned by a charm of hummingbirds. At this time of September, it’s a teenage charm with the ‘rents having gone south already for their tropical vacation, and the kids, some of whom are still hanging out at my place, partying at the sugar-water hanging kegs like there’s no tomorrow. After a usual summer of a few Ruby-throated hummingbirds hanging out at the edge of woods and near the feeders, right around early September, they seem to multiply overnight on their way south to winter in southern Mexico and northern Panama. My friend Pam, who sat quietly on our front porch with me yesterday to immerse herself n the buzz-chirp-rush of the birds, told me that the full-grown birds take off first, leaving behind the teens, who are old enough to be on their own without causing too much of a ruckus, and happy as the day is long and the feeders are full. While the ways of the teen are somewhat mysterious in humans, when it comes to hummingbirds, that mystery deepens because of all we don’t know about them. According to some sites I perused, hummingbirds are too little (weighing about 3 grams, smaller for the teens) to carry radio transmitters, and of course, these birds are difficult to catch, handle, and band, let alone recover the banded ones. It also sounds like we just don’t know a lot about their fall migration, except they are very much creatures of habit, returning to the same feeders around the same time each spring, and the males — the ones with the beautiful ruby-colored throats — don’t linger long after mating. What we do know is hummingbirds beat their wings 53 times a second, they weigh between 0.1 and 0.2 an oz., their hearts beat the fastest of all beings — 1260 beats per minute, they can migrate about 1,500 miles in a season, and they make an outrageous amount of song and sound. As I write this, these tiny, feisty miracles race-buzz by, then suspend themselves mid-air to stare at me, the dog, the cats — who stare back in amazement but are smart enough not to even try to get closer — before shooting off to the feeder. Sometimes there are a dozen or more zipping diagonally past each other from power line to feeder to high branch on the Osage Orange tree back around. Sometimes they squeak long dialogues before vanishing into the woods with a flash. Each swirl and angle of their flight, each call and wild rush of their wings charms all of us living this porch (and beyond) life. Listen to their calls and see them swishing around below in the little video I took, and learn more (and hear various kinds of calls) at this fantastic Audubon site and the Cornell All About Birds site. The little girls each pressed a velvet-like bunny into their chests, the girls’ chins nuzzling the sleep bunnys’ heads. A little boy let a large yellow snake wrap around his torso, the snake’s head balancing on the boy’s elbow. A woman rocked a ferret to sleep in her arms. A toddler stood amazed as the turquoise parakeet stepped onto his fingers. Tim can never forget how he felt as a child when he and his young friends were refused entry to their local pet store and not allowed to hold the animals. He knows that the total separation of humans and animals will ultimately lead to the disconnection of humans and nature. We truly believe in our mission. That mission is a healing balm in action, bringing us back together with the more-than-human species we’re part of, even if it’s happening in a store that sells dog food, crickets to take home and feed your pet tree frogs, and fish tanks. When I brought Shay the dog to Pet World on Saturday for the opening, I was so happy by what I saw — dozens of human animals and other animals getting to know each othe r in laughter, delight, even bliss — that I went back on Sunday, this time taking Ken with me. Unlike Shay (who was respectful and extremely interested in everything and everyone in the store), Ken got to hold a bunny and a dove, and also pet a gecko and snake in between watching the new younger tortoises and the giant, ancient ones adored with arms that looked like medieval body armor. The children filling the stores, along with their parents, grandparents, friends, and occasionally big or little dogs were experiencing more than an indoor petting zoo. I saw many Pet World employees showing kids of all ages how to let a bird come onto their fingers, where to put their hands when holding a guinea pig, or how to properly pet a tired lizard. One woman who worked there got on her knees to show a bunny to a newborn, both rabbit and kids having the same sized face. I’m all for watching and being with animals in the wild without disturbing them too much, but there’s something also essential in touching animals, and through touching, finding who we are as humans and as animals. Feeling the pads of the gecko’s feet on our palms, the claws of parakeet wrapped around our fingers, the beating heart of a rabbit or kitten or hamster against our own hearts connects us to the real magic in this world. For years a certain squirrel has tormented my cats, strutting his stuff in slow motion from the deck railing while both kitties watched from inside the house The more agitated the cats, the more indulgent the squirrel. He even jumped to the window that separated them, and the cats on the inside window sill and the squirrel on the outside, mocking them in his miniature parade of pride. If the windows are Cat TV, the squirrel was a daily reality show designed to inflame cat desires and piss them off. As such, it had high ratings: the cats were glued to watching the squirrel who caused them no end of aggravation. Karma takes many forms, even that of a fat cat. Although we try to keep our cats indoor because of the coyotes in the area, Sidney Iowa Goldberg has a habit of getting out, thanks to Shay the Dog who graciously opening the door for himself and the cat. Having a dog who can open many manner of doors and a cat jonesing to escape the safe bonds of the house is beyond our control, generic cialis safe although Sid is pretty overweight and moves so slowly that he’s relatively easy to catch. Either that, or he comes bounding to the door within an hour, having been taught well by the dog that this is how you get back in. The other day when Sid went on his afternoon walkabout, I didn’t think much of it, and as usual, I was relieved when he raced to the door to come back in. The next morning, just when it was time for the squirrel show to begin (it starts as soon as it’s light out), a curious thing happened. The squirrel returned, but not his tail. Strangely enough, the cats weren’t as interested in the squirrel channel, and they also seemed strangely at peace while Mr. Squirrel walked along the railing with a whole lot less confidence or balance. While I can’t prove Sidney bit off the squirrel’s tail, it sure seems like a good possibility. In the meantime, the bob-tailed squirrel is struggling with low ratings, but hopefully, still enough fallen bird seed and acorns to get by. 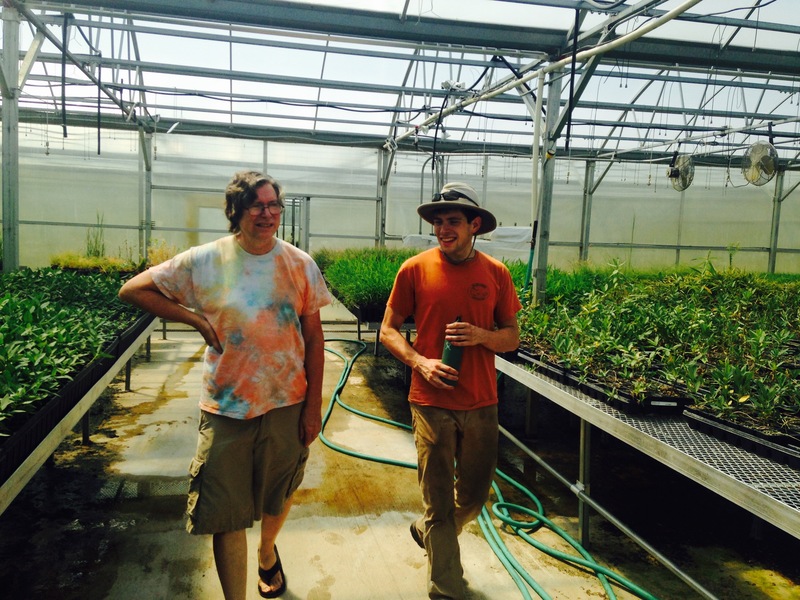 Daniel showing us the native prairie plant greenhouse on his last day of work there. I knew this was coming, but sometimes knowledge isn’t as useful as we wish it was. This week, within two days, Ken and I go from people who have lived with their kids in varying configurations for 26 years to empty-nesters. On Aug. 18, Daniel moves out to begin his masters in Landscape Architecture at the University of Wisconsin-Madison. On Aug. 20, Forest moves out to immerse himself in journalism school at the University of Kansas. From past bouts of grief-crazy nest-emptying I’ve learned how much being a parent means being an animal connected to another animal. Eight years ago, I cried on and off most of the way home from Newton, KS, where we left Daniel to begin college, and for the next week, found myself curling up in his bed and sobbing in between opening the fridge with great joy that all the groceries I bought were still there. Five years ago, I did it again, this time driving Natalie on my own to the Twin Cities. While she attended vibrant orientations at her college, I multi-tasked: I cried hysterically and got lost all over St. Paul and Minneapolis. Now, just back from Vermont, I’ve landed at home in the middle of mayhem, laundry, and the dance of desks. Turns out the massive, oak desk a friend gave Daniel fit into my car (which involved unbolting seats) but wouldn’t fit into his, so yesterday, we moved that surely-heavier-than-a-refrigerator desk into Ken’s office, Ken’s desk onto the porch where it quickly found a home with a friend, and Ken’s grandpa’s old green metal desk into Daniel’s car. Meanwhile, there were hundreds of t-shirts to fold while sorting things into staging area #1 (Daniel’s), and staging area #2 (Forest’s). When I’m not doing such things, I feel lost and confused. Today as I drove to meet Kelley for pizza, I wondered what I would eat because I wasn’t the least bit hungry. Half an hour later, I had eaten most of the pizza we were sharing, plus dessert, and I could have kept eating, all sensors broken on what’s enough or too much. Later, I took too much time picking out laundry detergent for Forest and ended up missing yoga class. I froze in an aisle of Target, wondering what to do. Go home and pack more for Daniel? 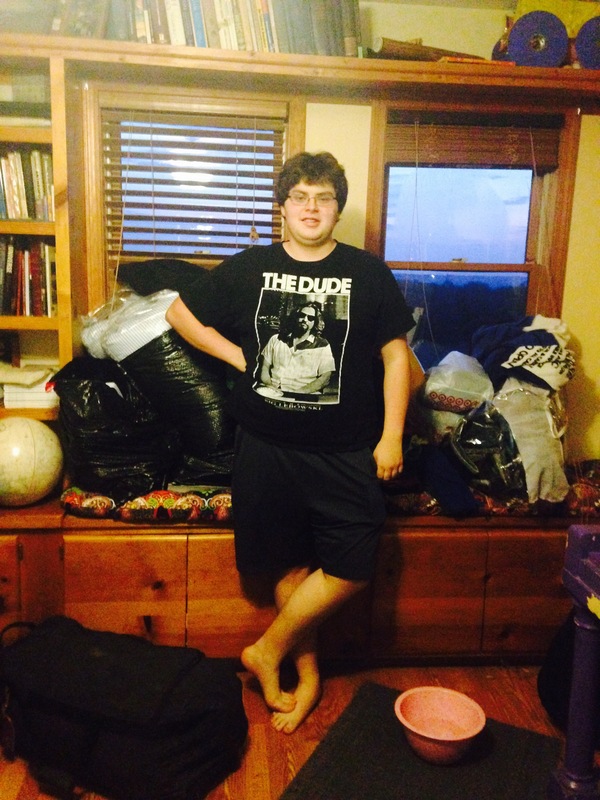 Clean the basement and re-arrange all the furniture? Drive to that frozen custard place at high speed? Take a nap? I couldn’t tell so I aimed myself to a thrift store, where a man in the next aisle sang out to me, “I am standing in the middle of the field of mystery.” I wanted to sing back that I was standing in such a field too, but it turned out he wanted my opinion on whether an embroidered foot stool was worth $10, and the last thing I could do was conjure up an opinion. I gathered the flannel pajama pants I found for Forest, but fled the store after finding that a woman in line in front of me had at least 50 items in her shopping cart. Instead, I made myself go do something physical, which seems like the only sensible thing to decide when a person can’t decide anything, and in 20 minutes, I was in the pool swimming laps. I wish I could say the motion and water calmed my ramped-up mind, but it was more that my ramped-up mind found a great rhythm for keeping its pace while I swam. What was I thinking about? How to pack Daniel’s car, which I just did, playing to my strength of squeezing too much stuff in too little space. I delighted in piecing a down comforter into a tiny space between a toolbox, violin, and computer speakers. Now that Daniel is ready to roll first thing tomorrow morning, I’ll be aiming my attention to staging area #2 in between bumping into myself coming and going, all the time pacing, swimming, packing, hauling, and standing around very confused, sad, excited, stunned and perhaps even joyful in a field of mystery.